Awesome movie! had to watch it twice and I don't ever watch movies in the theaters twice! so, this movie has a lot of explosions and carnage, which is a great movie to watch if you are a man. Which I am so I think it's awesome. I think it has an interesting plot, although it is predictable in a way. The heroes don't get along in the beginning, they quarrel and bicker, but as soon as a worldwide threat is introduced they put their differences aside to defeat the enemy. The 3D is amazing, the graphics are unbelievable, and the movie as a whole is incredible. Released domestically May 4, 2012, it set the record for the biggest opening debut in North American cinematic history with a weekend gross of $207.4 million. 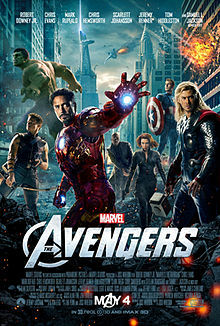 The Avengers tracked ahead of 2008's The Dark Knight ($158.4 million) and 2012's The Hunger Games($152.5 million), which held the record for the second and third best opening weekends behind 2011's Harry Potter and the Deathly Hallows – Part 2 ($169.2 million). OnMovieTickets.com, North American ticket presales during the week before release exceeded those of Captain America: The First Avenger, Iron Man, Iron Man 2, and Thorcombined during the same period, by over 150 percent.